We love sweet potatoes, as you know. We make lots of great dishes with them, including a delicious Filipino dish called Ube, but today we are going to share a new way to enjoy these ultra delicious potatoes. We like eating these before or after a long or high intensity workout. Along with Taro, Green Plantains, and Cassava we consider these excellent sources of low glycemic carbohydrates (or “safe starches”). Sweet Potatoes are also high in caratenoids, vitamin C, potassium, and fiber. This dish boasts fresh ingredients, coconut oil and is jam packed with perfect carbs and glucose. Heat coconut oil in a large skillet, once really hot add fresh curry leaves, rosemary, capers and onion. The curry leaves will get nice and crispy…you want that. 🙂 Continue to cook on medium – high, depending on your skillet. With a vegetable peeler peel sweet potatoes and then slice them with a mandolin. Once the onion slices are golden brown, add potato slices and toss until they get a little brown. Then add the sherry, salt and pepper, cover and reduce heat to medium. Cook for 20 – 30 minutes. Depending on your skillet and your stove, you may need to add a sprinkle of water or two within the cooking time. Make sure to check often to ensure that you are not burning them. 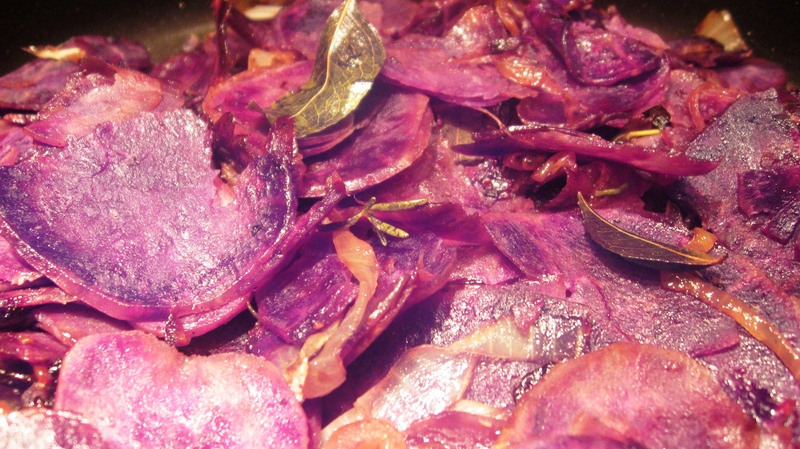 This is a great side dish and we hope that will enjoy it as much as we do. Wow I’ve never seen purple sweet potatoes before, they actually look quite delicious. I haven’t seen those available in any of the stores in my city though. I found purple sweet potatoes at Whole Foods. I think it will be worth my trip over there to get them again, as I thought they were tastier than regular sweet potatoes.